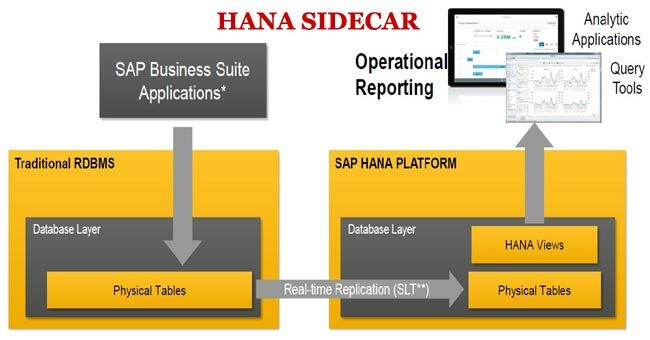 SAP HANA Sidecar helps a person to keep continue with his already existing system same along with the use of SAP HANA in form of secondary database as he was doing before. The already existing system transfer the data from database to application layer. And all the calculations take part within application layer. And on the contrary HANA Database is being optimized for bulk parallel processing and submit a set of results to the application after performing all the calculations within database layer. 1. Still Need SLT: While you are using SAP HANA Sidecar whenever a change or update trigger you also require SLT or Custom Code to load HANA with the help of secondary database connection. It also need realtime loading within SAP HANA Sidecar. 2. Data Must be Loaded with the help of ABAP Custom Code: Data Loading to Hana database from simultanous database must be done using ABAP cusotm code or already present replication scenario like, Data service or SLT etc. 3. Custom ABAP Programs are Must: To avail the connectivity of Hana Database and update, insert or retreive the data one require custom ABAP programs. These custom ABAP programs are optimized to run SQLSCRIPT so that HANA calculation can be done effectively to completely optimize the performance of SAP HANA in form of sidecar. 4. SUSE LINUX SP11 is Must: It is must because HANA runs only over it. If it is missing then you will face the requirement of hardware particulary for HANA. 5. Only Improves Reporting standards doesn't help in the improvement of daily performance of already present transaction system. 6. It is similar to use SAP HANA Sidecar in BW Landscape like BWA in ongoing BW landscape. SAP HANA can be used for specific functionalities in parallel to a classic SAP database. This scenario is called sidecar or side-by-side.